Flushing: A model for Quincy? 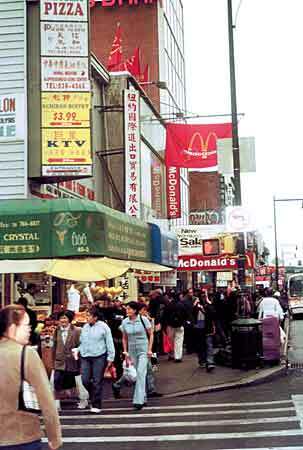 Main Street in downtown Flushing, Queens, in New York, is dominated by Asian businesses. Inside the Starbucks on Main Street, menu offerings like Caramel Macchiato, caffè lattes and crumb cake are listed not only in English, but in Chinese and Korean as well. The coffee shop, increasingly a staple on street corners across the country, is next to Amerasia Bank, Luck Joy Restaurant No. 1, an insurance agency and a car rental company, all with signs in English and Chinese. Not too many years ago, Flushing, a neighborhood in New York City’s borough of Queens, was scattered with American-fare restaurants and run-of-the-mill shops. Today, the street feels something like strolling through another country, where residents and merchants banter in foreign tongues, and characters that make up Asian alphabets dominate storefront signs. Less than 15 miles from Canal Street, the heart of Manhattan’s better-known and more established Chinatown, a second Asian enclave is thriving. Flushing is a case study in how an alternative to a historic and successful Chinatown can develop when location and population mix. Some believe Quincy could eventually follow the same model to become an “ethnic crossing” south of Boston, especially now that Asian supermarkets and an Asian mall are opening in the city. Spurred by a wave of residents who sought cheaper housing than could be found in overcrowded Manhattan, an Asian-American community began blossoming in Flushing two decades ago. To cater to the growing clientele, grocery stores, restaurants, pharmacies and a host of other businesses sprang up. Now, Flushing serves not only its own Asian-American residents, but on weekends attracts customers from Westchester County, Long Island, New Jersey and Connecticut. They want to shop for Asian food and other items, or enjoy a meal at an authentic restaurant, but are unwilling to endure the impossible delays and parking problems inevitably associated with a trip to Manhattan. Kao T. Li, executive director of Quincy Asian Resources, used to live in Wayne, N.J., and shopped in Flushing. 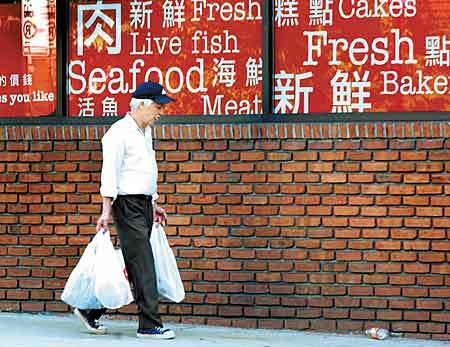 “It was easier for me to drive to Flushing than it was to go to Chinatown,” Li said. Of course, Quincy is not Flushing, and it is unlikely to replicate its look and feel any time soon. For one thing, Flushing is a neighborhood in one of New York City’s five boroughs (imagine a city within a city within a city). Fred Fu, president of the Flushing Chinese Business Association. Data on the neighborhood is imprecise, since it is not its own city and boundaries are not neatly defined. But it has a population of roughly 58,205, more than half of which is Asian-American, according to New York’s Department of City Planning. Another 40,000 Asian-Americans live in surrounding neighborhoods. By contrast, Quincy has roughly 13,500 Asian-American residents, accounting for a little more than 15 percent of the total population. Slightly less than 10,000 Asian-Americans live elsewhere on the South Shore. Flushing has a long history of diversity. Before the 1980s, Quincy was almost entirely white. Still, the similarities between the two communities are many. Both are situated toward the end of subway lines. Both sit at the crossroads of major highways, and both saw an influx of Asian-Americans in the 1980s. John Liu remembers the Flushing of the late ’70s, when there was a pizza joint on every corner, an Army-Navy surplus store, diners, doughnut shops and pubs. Now, that place is hardly recognizable. Liu, who is New York City’s first Asian-American city councilman, said a recession in the late 1970s left many traditional businesses struggling. By the early ’80s, Asian-American business owners started stepping in to fill vacant storefronts. After the first stores opened, family and friends began to understand that Flushing offered opportunity, Liu said. The transformation from traditional Main Street to Asian enclave, however, has not been without problems. Racial tensions continue, as some longtime white residents argue that their neighborhood has been overtaken. Some believe Quincy could become a suburban satellite commercial district to Boston's Chinatown. Here a man leaves the Super 88 market on Hancock Street. Harrison later apologized, but tensions clearly remain. One longtime resident strolling through the local library branch recently lamented the loss of neighborhood traditions. Stores used to chip in for Christmas lights, she said. And she recalled fondly a diner that used to be nearby but closed a few years ago. “We saw a lot of our culture pushed aside,” the woman said. To Liu, communication is the key to healing any rifts that emerge.